Hydrates and hydrate plugs can restrict flow, damage equipment, and potentially jeopardize the safety of personnel. Hydrates are formed as a result of the bond between gas and water molecules that occur at high-pressure, low-temperature environments. In deepwater, hydrates can form at temperatures higher than the ambient seabed temperature; hence, prevention and remediation of hydrates is a serious concern for deepwater operators. Figure 1 shows a family of hydrate curves for various gas and water compositions. Each curve on the graph represents a region of pressure and temperature where hydrates are stable (left side of the curves) and where they are not stable (right side of the curves) for different parameters in the produced fluids. The curve furthest to the right is a methane/fresh-water mixture. This is effectively the worst case curve for oil and gas operations. If the gas is heavier than methane, for instance ethane, or a mixture of ethane and methane, the curve shifts to the left, increasing the hydrate free zone. If the produced water contains salt or hydrate inhibitor, the curve will also shift to the left. 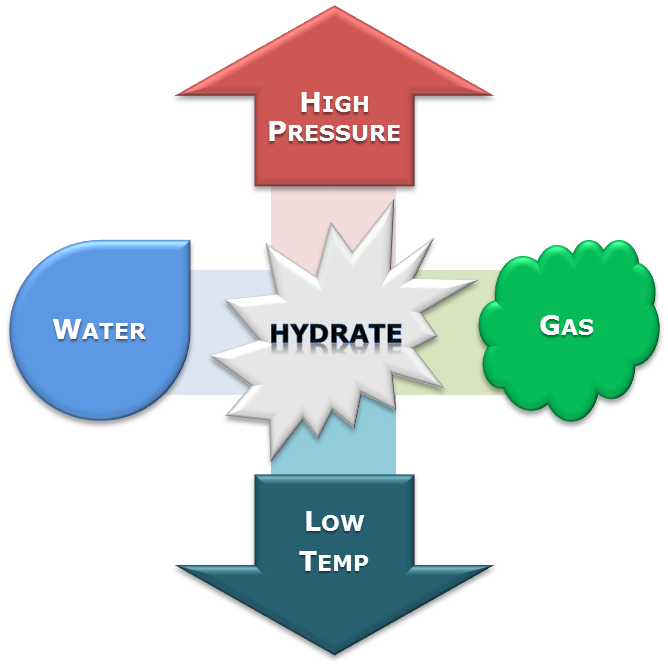 The fluid characteristics and the water composition are used to generate a hydrate curve using commercially available thermodynamic software. It may be important to update the hydrate curves during the field life whenever the fluid chemistry undergoes a significant change due to water breakthrough, gas coning, commingling of different fluids, hydrate inhibitor injection, or other scenarios. Operate at pressure and temperature conditions outside the hydrate-stable region via heating, heat conservation, pressure control, etc. Displace hydrate-prone fluids with dead fluids before the hydrates can form. Move the hydrate curve to the left by adding a hydrate inhibitor such as Methanol (MeOH) or Mono Ethylene Gycol (MEG). Remove water from the hydrocarbon stream (liquid water is required for hydrate formation). Inject Low Dosage Hydrate Inhibitors (LDHI) that prevent hydrate agglomeration. Inject Kinetic Low Dosage Hydrate Inhibitors to delay the onset of hydrates. In subsea oil production systems, hydrate mitigation methods during steady state operation are almost always based around heat conservation. For a very long flowline, or for late life production at low rates, this may not be feasible. In such a case, continuous LDHI injection may be used. Continuous MeOH injection has been used, but this is quite rare. Blowdown of the subsea system to decrease the pressure. Displacement of the live fluids with dead oil and/or methanol. System insulation must permit adequate time for operators to perform these displacements. In subsea gas production systems, hydrate mitigation by heat conservation is more difficult to achieve. Continuous injection of MEG is common on long offset gas flowlines. MEG is used rather than MeOH primarily because it can be more easily recovered and reused. Export pipelines are most often protected by removal of water from the sales fluids. The most commonly used hydrate inhibitors are MeOH, MEG or anti-agglomerate LDHI. MeOH is cheaper per gallon, but may be expensive due to the amount that must be used to ensure hydrate mitigation and because of quality penalties due to refinery MeOH acceptance limits. At water flowrates higher than 2,000 barrels per day (BPD), it becomes difficult to get enough MeOH subsea to treat the produced fluids and another hydrate mitigation technique must be used. However, MeOH still plays a critical role in many operations and is usually used during shut-ins for line displacement and bull-heading the production tubing. MEG is more expensive than MeOH, but it can be recovered from the produced fluids on the topsides and recycled for further use. However, its higher viscosity can require increased subsea delivery line diameters and pump pressures. Anti-agglomerate LDHI is the most expensive in per-gallon price, but the amount needed is much less than MeOH. LDHI rates typically used are around 1-3% based on water rate. LDHI is more effective at higher water cuts as they remove the rate limitations associated with methanol treatment, but there is a limit due to the fact that LDHIs do not prevent hydrate formation. Rather, LDHIs prevent hydrate crystals from bonding to other hydrate crystals. This yields a slurry rather than a plug. At high water cuts, the formed slurry inhibits flow. This commonly serves to limit LDHI application to maximum water-cuts of between 50 and 75%, depending on the field. The first step in remediating a hydrate plug frequently involves the need to accurately locate its position. This can be attempted by pressuring up one side with a known volume and measuring the pressure increase. Depressurizing only one side of the plug is potentially very dangerous. A hydrate plug will melt from the pipe wall. At some point the plug will release from the wall. If there is significant differential pressure, the plug may be hurled at tremendous velocities; over 1,000 ft/sec in some instances. At these velocities, the plug can cause major damage, including pipe ruptures, such as if impeded at an elbow. Software is available for predicting the velocity and travel distance of a plug. In subsea systems, there is often no access to the backside of a plug. Two-sided depressurization then requires intervention either with coiled tubing, or subsea remote-operated vehicle (ROV) pumping to relieve pressure. If there are multiple plugs, then it is very unlikely that the space(s) between plugs can be vented. Often the platform side of the plug cannot be depressurized easily either. If significant liquid head exists, there may be no easy way to remove the liquid. Heating of a hydrate plug is potentially hazardous as well. Upon heating, a hydrate liberates a great deal of gas. If that gas is liberated at the center of a plug and the remaining plug is not porous in either direction, the liberated gas may over-pressure and burst the pipeline. Hydrate remediation is greatly facilitated if stab-in points for subsea pumps or coiled tubing are provided to permit access behind a plug. These should be considered carefully during design.